This book is on sale on Amazon for $0.99 (regularly $4.99) 2/1/2019 - 2/6/2019! When Julia’s secret is revealed, those in power will stop at nothing to silence her. How far will men go to destroy a woman who has been dead for centuries? 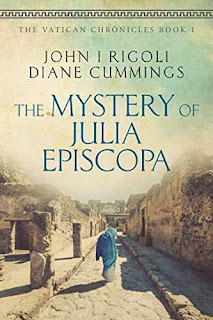 In ancient Rome, Julia flees for her life. Hidden beneath her robes are secrets men will kill for. Men she once called ‘brother’ have stripped her of power, murdered her child, and are determined to destroy her in order to perpetuate their vile heresy. In modern Rome, two young archeologists uncover a scrap of parchment which leads them to Julia and to the legacy she died to protect. Erika and Valentina find themselves caught in the cross-hairs of a venomous Vatican battle for power and supremacy. Will they meet the same fate as Julia? Two-thousand years of history, built on a lie.